This example has to do with using the Arc command while in the sketch environment. As you can see, I have drawn a line up from the origin of the sketch and I am still in Line mode. Now I want to add a tangent arc on the end of the line. To do this, I have a couple of options. The first and slowest option is to type the Escape key to exit the Line command and then select the Tangent Arc command from the toolbar. A quicker option is while I am still in line mode, drag the mouse back over the line and then drag it back out making sure to go over the endpoint both times. This will put me in Tangent Arc mode and I can draw the arc. The fastest way to accomplish this is to simply type the A key while in line mode to toggle the Tangent arc command. 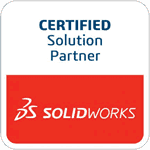 As you can see, there are many ways to do even the simplest of tasks in SolidWorks. When you look at the different options I used, it’s plain to see that using the shortcut key took the least amount of time. As I’m sure you know, when you’re working on a project, Time is Money. The best thing you can do is to always be on the lookout for quicker ways of getting the job done. Take the time now to learn about things like shortcut bars, shortcut keys and mouse gestures to help you save time, and money in the long run.